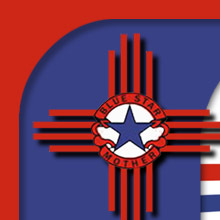 The Blue Star Mothers of America, Inc. is a nonpartisan, nonsectarian, nondiscriminatory and non-profit organization. Please read the qualifications for membership before printing the application below to be sent via USPS or bring to our monthly meeting. Any woman who filled the role of birthmother, adoptive mother, step-mother, foster-mother, grandmother or legal guardian of a service member at any time in that service members' life who (A) is currently serving in any branch of the Armed Forces of the United States; or (B) have served and been discharged from the Armed Forces of the United States; and (2) She is citizen or legal resident alien (a permanent resident is someone who has been granted authorization to live and work in the United States on a permanent basis) living in the United States or Citizen living outside the United States (stationed or living outside the United States). Blue Star Dads is in the process of reorganization. Dads we need you!! Until Dads are reorganized they should apply as an associate member. We do have Blue Star Dad Pins. Individuals who do not qualify for Membership may join as Associate Members. These Members are not required to pay dues nor do they have any rights to hold office or vote. A Blue Star Dads Association and/or other auxiliaries may be formed in association with the Corporation subject to the terms of the Governing Documents. Dues for Blue Star Mothers is $30 a year. Associates membership is free. Pins are $12 each. We have Blue Star Mothers Pins and Blue Star Dads Pins. Please note which one you are ordering with your application. Regular membership meetings are held the 3rd Saturday of each month at 9:00 AM. Please check our Calendar for any changes of time or location.